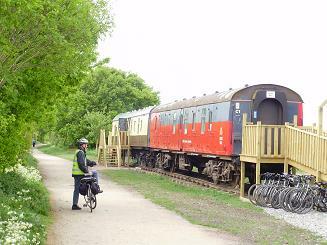 Stratford Bike Hire is based in refurbished Royal Mail train carriage located at the Stratford Greenway. We are only a short walk from the centre of beautiful Stratford upon Avon. We also provide a cycle delivery service for Stratford upon Avon and the Midlands, including Leamington Spa, Coventry , the surrounding area of Warwickshire and the Cotswolds . Simply contact us to reserve bikes and pick them up from the carriage at the Greenway. The Cycle Hire Centre is open but with limited hours during the week depending on bookings. Call before setting off so we can ensure someone is there to meet you. Visitors to the Greenway can start and finish their cycle from the cycle hire centre at the start of the track. You can rest, relax and get refreshments at the Carriages Cafe next door to our cycle hire centre , or in the middle at Milcote crossing. For accommodation in Stratford. Click on the link below for a range of quality accommodation. We can provide a discount voucher for Shakespeare Houses admission packages. Gives a saving of 30% on a five house ticket! See our Shakespeare Houses Page for more details. See Prices page for our charges, delivery is free for full day hire within 6miles of Stratford, must be arranged in advance. For greater distances please Contact Us for delivery charge.